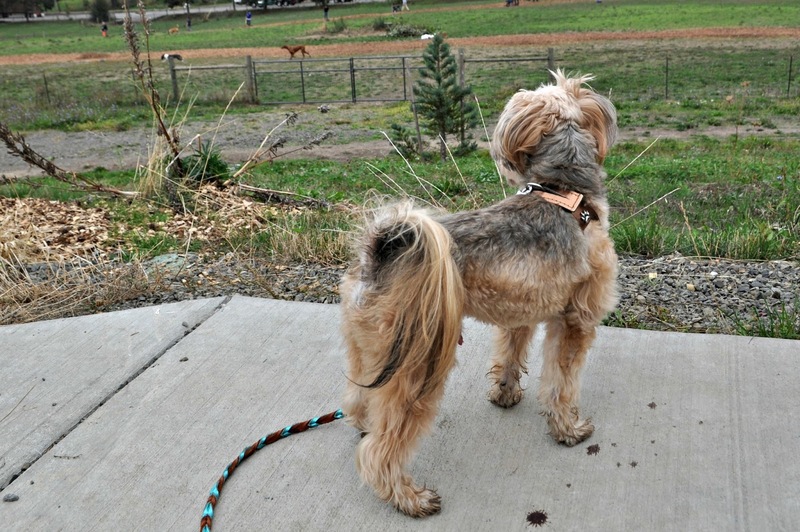 Mr. N walks nicely on a leash, 99.9 percent of the time. Children can walk him and they have under supervision and in quiet areas. That 0.1 percent is what gets him in trouble. Mr. N is what is known as a “frustrated greeter.” He gets super excited to see other dogs and he will pull and bark and lunge on leash. These are classic symptoms of a leash reactive dog. He is a lot better than he used to be. The very sight of a dog would send him into a barking, lunging frenzy. Now, he can walk and ignore other dogs across the street. We’re still working on passing dogs on the same sidewalk. He can sometimes walk past very calm dogs who are lying down and not looking at him. Mr. N ignoring the dog behind the fence who is barking at him. He says it’s very hard. We’ve been making this progress mostly with the LAT (Look at That) method from Leslie McDevitt’s book, Control Unleashed. The premise is pretty simple. When your dog looks at a trigger (dogs, scary strangers, bikes, squirrels, skateboards etc), you reward them for looking at the trigger. It sounds counter-intuitive but it works! They learn to neutralize the trigger and focus back on you. Eventually, the dog will look at the trigger then automatically look back at you. This works both for dogs who are over-excited like Mr. N and dogs who are anxious or fearful. You should start by practicing the cue with neutral objects that your dog won’t react to then gradually add in lower-level distractions then work your way up to higher-level ones. For the neutral object, you could use a bottle or other household item and point at it and when your dog looks at the bottle, use a marker word like “yes” or click with a clicker and reward. If your dog is dog reactive, Melissa & Doug makes quite realistic stuffed dogs you can use to practice with. Mr. N knows he did a good job by looking at the other dog and not reacting. Reward please. 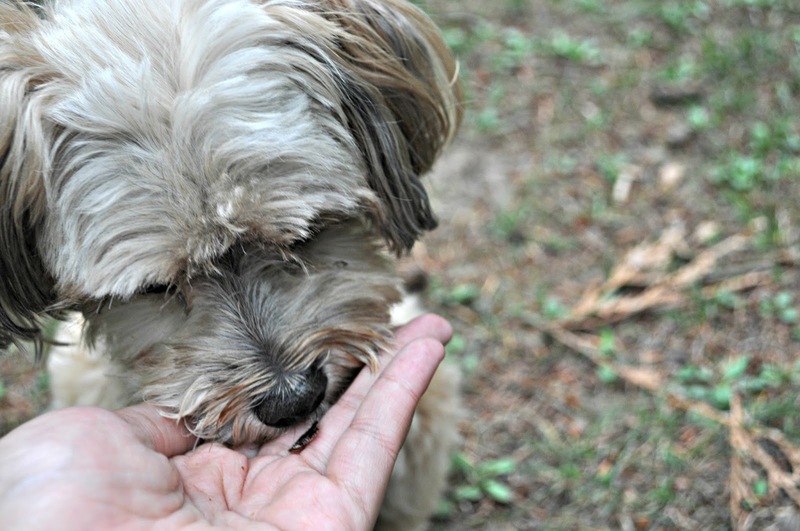 For the reward, you must use something the dog finds immensely rewarding. Reactivity work is very difficult for the dog and the reward must match. No kibble or dry treats! Unless your dog is willing to jump off a cliff for those. Mr. N is picky about his rewards so I can pretty much only use meaty treats and cheese. Right now, we’re using jerky treats because Mr. N deems them worthy, they take a second or two to chew (less time to think about barking), and they’re healthy and made with good ingredients so if he sometimes gets a ton of treats for not barking, so be it. It’s important to make sure your dog is not past threshold (calm and not over-aroused) when you do this. It has to be at a distance your dog can handle. So if you have to start at a football field’s distance, that’s what you do. Other things will affect your dog’s threshold. With Mr. N and dogs, the following can impact his threshold: motion, speed, multiple dogs at once, dogs paired with a skateboard/bike, dogs giving him a hard stare, off-leash dogs, the other dog barking. Trigger stacking is also important to keep in mind. Multiple triggers will affect your dog’s ability to keep it together. I always think of it as akin to dieting. If you’re presented with multiple temptations throughout the day, (doughnuts at breakfast, co-worker’s birthday cake at work, lunch invitation and offers of pizza for dinner) it’s a lot easier to give in. You only have so much impulse control. You may be good all day and then something sends you over the edge and you gorge on ice cream. Same goes for your dog. They may ignore the first five dogs and then after the sixth one will turn into a screaming maniac. Mr. N has conquered bikes and joggers and squirrels and cats for the most part using this method. We’re continuing to work on his hardest challenge: dogs. He tries very hard and sometimes he backslides but we’re getting there. No dogs were barked at during the making of this post. It is very difficult to capture a squirrel and dog in the same frame. 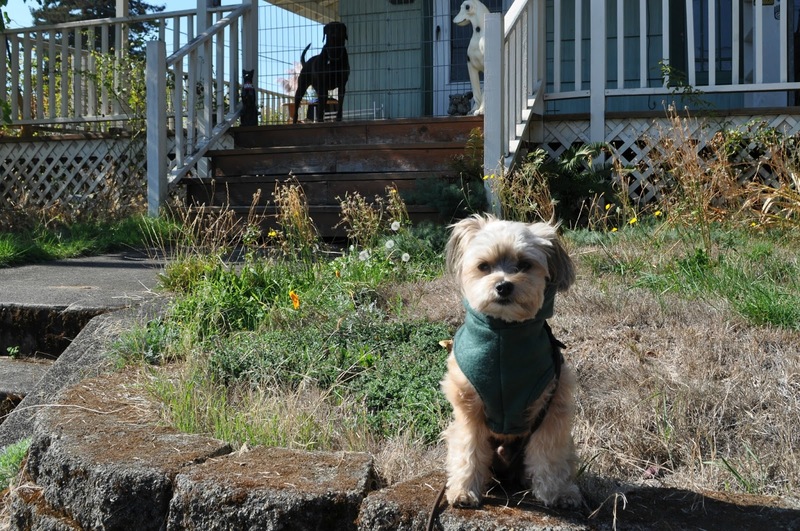 Welcome to First Monday’s Positive Pet Training Blog Hop hosted by Cascadian Nomads, Tenacious Little Terrier and Rubicon Days. Please share your responsible pet owner positive pet training tips by linking a blog post or leaving a comment below. Any positive reinforcement training posts or comments are also always welcome. The Positive Pet Training Blog Hop goes all week long. Our next hop will begin Monday, Nov. 2nd with a training and exercise theme and continues for a week. *We are a participant in the Amazon Services LLC Associates Program, an affiliate advertising program designed to provide a means for us to earn fees by linking to Amazon.com and affiliated sites. If you buy something after clicking the affiliate links on this site, your item will not cost more but the pennies will go towards Mr. N’s treat allowance and upkeep of this site. We use "what's that" because it's easier for me to spit out, but the same thing 🙂 It's been life changing. Now, if we see a dog on the opposite side of the street, Barley starts looking at me expecting a snack before I can even say anything, so we've graduated to random treating. She's like Mr. N and still needs a little bit of space with most dogs–we can pass a calm dog on the trail if I move her to my right instead of my left, but most of the time we have to pull over and sit and work on focus while they pass. Good work, Mr. N! I use "look" as a cue. Mr. N is much better if I carry him past a trigger and I'll do that if we're in a tight spot like narrow hiking trails. So happy to hear of your progression Mr.N! It really does just take patience, time and a good teacher :). By socializing Kilo as much as I can safely I've also noticed a big change in his attitude towards other dogs or people while out walking. Lots of patience! I hope Kilo continues to make progress too. I'm glad to hear of this fantastic progression! Good man, Mr. N! Good job Mr. N! Sounds like a training method that makes sense. Great job, Mr. N! Keep up the great work! OK First, Mr. N is insanely adorable! This is a great method and I think we will give it a try with our pug puppy. She is generally OK with dogs and people but cars send her into a barking frenzy. Thanks for the tips! It is so great that Mr. N is doing so well!! This method sounds like something that might work with Luke. I think I might need to add that book to my library too. 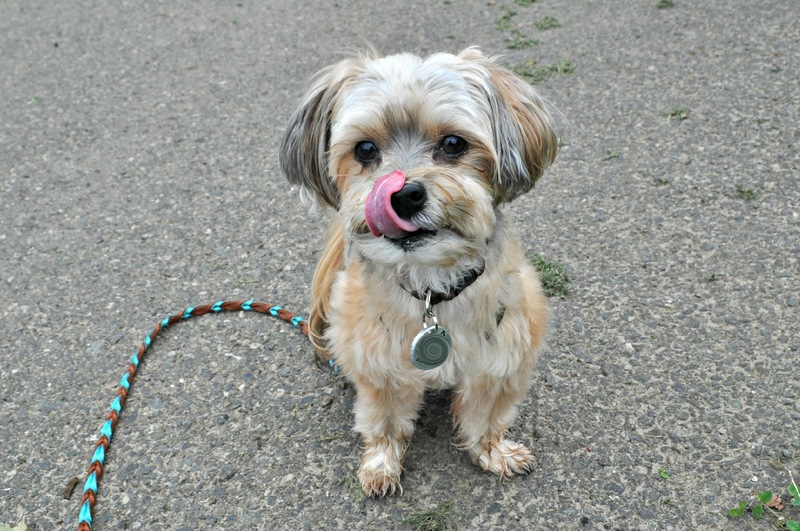 One good thing about Luke is that he is not as picky about his treats. I can mix in lower value with high value (his favorite are freeze dried liver treats), and he'll do well. Also, thank you for explaining trigger stacking so well, I kind of knew what it meant but that really made it clear. We'll be joining the hop later this week! I'm glad my explanation helped! Which method are you using with Luke now? I distract him with treats (which is starting to work), but I usually try to get him not to pay attention to whatever is bothering him. I do keep him at a safe distance as well…right now across the road from a scary stranger is working for him. Outstanding Mr. N. I have yet to find something that would work with either Harley and/or Jax. They both react to different triggers. I will look into this. I hope it works for them! Interesting! I'll have to keep this idea in mind. I need to find a better way to stop Shiner from reacting to the cat. I'd like for them to be friends. Or at least for Shiner not to think that the cat is the thing of evil. She does pretty good, but I still have to watch them very closely. I'm still working at figuring out Luna's triggers. I need to be better about writing them down. Thanks for writing about your experience! *Gorges on ice cream. * I'm SO impressed with Mr. N and that barking dog. OMG, my dogs would have none of that. They would bark themselves silly. We would have to start the training TWO football fields away. hehe Very nice job with this (the training and the post – love how you fit that subtle review in there, too). What a great tip! I will be using this for Tucker and Jasper who are just like Mr N when they see something they just have to get. Nala and I play "Look at Cat"! Although the cue is "Where's the kitty?" It's really helped her learn not to get stuck staring at cats, or fixate on the possibility of chasing them. Control Unleashed has lots of great games! 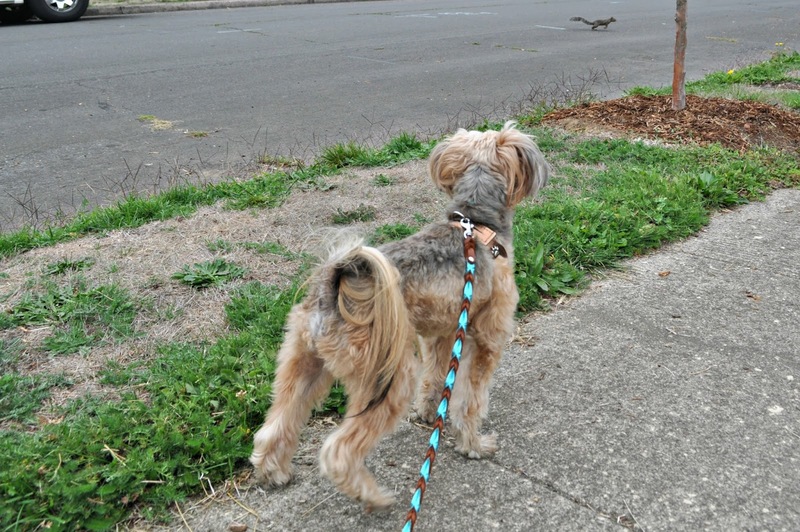 Wow, nice work capturing squirrel and dog at the same time! This is interesting, because I had kinda figured out on my own through trial and error with Rita that she seems to do better if I "warn" her things are coming by saying "look at the dog" or whatever is heading our way. I guess I should have started a little further away and w/ totally neutral objects… but she really has come a long way. There are definitely days that she's still on high alert, and I'm pretty sure certain dogs will never be okay w/ her (she's got this one nemesis who charged us off leash one time…) but at least I feel like we are on the right track. It's a long slow process for us – mostly because of me – I'm not the world's best trainer! Meant to also say… I'll have to try out those treats. Rita's not super treat motivated so her really high value stuff for this kinda thing is cheese. Effective, but not the healthiest option! Having something tasty that would take her a second or two to chew would be good! I've found this a very helpful tool also. But it can be hard to manage your surroundings. I once took my dogs to a park where we could sit over 200 yards (that's 2 football fields) away from a dog park and keep them below threshold. Suddenly I hear a woman shouting at her dogs to return to her. She left the dog park with two unleashed dogs who absolutely did not listen to her. Of course they made a bee-line for my dogs and got into a scuffle. The woman had the nerve to tell me the fight was my fault because I had my dogs leashed 200 yards away from the dog park (in a leash-only area). Now I appreciate trainers who can set up safe and controlled situations for training. I'm absolutely going to do this with my Mr Twix. Absolutely fabulous information – we've referred pals here all dis week! Thanks for sharing – and I absolutely lub, lub, lub, lub, lub Mr. N!! Great tips and great progress. I need to try more of your tips because they have obviously worked!!! Thanks for sharing! This is advice comes at the perfect time for my puppy. Recently Bailey has become nervous when people or pets are walking on "her" sidewalk. I'm going to try your reward system. Thanks. This is pretty amazing to me! I will have to try this. Terrific post! This is such helpful advice, I like this method. LAT is the opposite of what you think it would be. I need to share with my mom. I live with a super reactive dog on leash – I also use Look At Me and it's a fabulous training method. He still reacts but I have better control. Great post – thank YOU. This has been the biggest challenge with Ruby because a) her thresh-hold distance is at least a football field and that's really tough to control in a suburban setting and b) she usually won't take treats outside in the presence of anything remotely interesting. In a complex overrun with rabbits, this is a struggle. You've done so well with Mr. N. and should be proud!